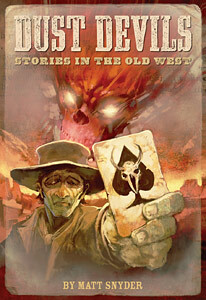 I’m very proud to share that Dust Devils is now available in the latest Bundle of Holding offer. This is a pay-what-you want bundle for DRM-free PDFs that helps support charity! And, of course, Dust Devils by me. I’m extraordinarily excited about this bundle. These are seriously high quality games, and you can get all of these for $11, or a few of them for smaller donations. Second, this helps boost two worthy charities, Heifer International and War Child. These are both causes important to me (and even to Dust Devils via cattle – yay!). I stumbled on some great music for Dust Devils inspiration. It’s a band called The Builders & The Butchers. Their album Western Medicine is great! Also reminds me of the EP The Last Pale Light in the West by Ben Nichols. It’s directly inspired by Cormac McCarthy’s Blood Meridien. And, there’s always this atmospheric instrumental by Earth called Hex: Or Printing In the Infernal Method. I listened to that one while writing the “revenged” edition of Dust Devils.